When the news broke that Lebanon’s head of internal Intelligence Wissam Al-Hassan and eight others had been killed by a car bomb in a residential area of Beirut on Friday morning, I was angry and saddened but not surprised. Al-Hassan is yet another prominent #Lebanese assassinated because murderous lowlifes objected to something he said or did. I remembered with a shudder that terrible day, the 14th February 2005, when I learned that my dear friend former #Lebanese Prime Minister Rafic Hariri had suffered a similar fate and rushed to Beirut to offer my personal condolences to his widow and children. Al-Hassan was Mr. Hariri’s Chief of Protocol and a leading figure in the March 14th movement. When will the #Lebanese band together to put an end to this nightmarish plague which has begun to be inextricably associated with their beautiful Mediterranean country even in the minds of those who love Lebanon as I do. When we think of Lebanon nowadays, our thoughts no longer dwell on spectacular God-given landscapes or the wonderful times we enjoyed in what was once our prime vacation destination. Now, the first thing that springs to mind is murder and mayhem. Is #Lebanese life so cheap that killing has become a run-of-the-mill solution to resolve political disputes? Lebanon is supposed to be a democracy with a parliament made up of sophisticated, often glamorous politicians who put on a good show. Yet all their carefully-crafted speeches and promises of reform aren’t backed with action. Each time a good man is cut down in his prime for trying to make a difference, they make another plea for “national unity”. Unfortunately, unity doesn’t feature in the #Lebanese collective psyche. They’re privileged to live in a small gem of a country. They’re dynamic and well-educated. But rather than put those gifts that many people of other nationalities would die for to good use, they remain glued to a self-destructive path, strewn with vengeance and vitriol, that has brought them nothing but violence, civil war and damaging outside interference. As if they don’t have enough problems already, they’re fighting each other over Syria!! Government and politicians must accept the lion’s share of blame for this tragic state of affairs. They are doing a disservice to the people they’re duty-bound to protect. They should take time out from arguing with one another to keep their citizens safe. That’s easier said than done you might think. However, in reality, many of the divisions and consequent bloodshed within Lebanon stems from the country’s vulnerability to outside influences. It doesn’t need to be that way. It’s surely beyond time that the #Lebanese, whether Christians, Sunni Muslims, Shiite Muslims or Druze, refuse to permit their land to be used as a proxy battlefield and reject leaders who are little more than marionettes manipulated by foreign powers. I struggle to understand why the #Lebanese never seem to learn from past mistakes. Clearly history has taught them nothing. It’s no cruel accident of fate that Lebanon has been invaded, bombed, brought to an economic standstill and carved up into sectarian ghettoes so many times in recent memory. In the first place, the system of governance requires urgent overhauling. Lebanon’s citizens should quit labeling themselves according to their religious beliefs and become one people. Whether they worship in a church of a mosque should be nobody’s business but their own and should not preclude anyone from sharing an allegiance to one flag. As it stands, the confessional system is detrimental to achieving unity among the population because it forces voters to think in terms of Sunni, Shiite and Christian when they should be free to choose the most suitable candidates regardless of his or her faith. Lebanon’s finest minds know this and for decades there have been discussions about dispensing with this outdated formula born in the summer of 1943 when Lebanon gained its independence from France. Thus far, nothing has been done for fear of upsetting powerful individuals and groups that might lose out were real change to be effected. Secondly, a nation smaller than Switzerland, consisting of just over 4,000 square miles with a population of well under five million, is not in a position to act as a surrogate regional player for other, far larger countries. Instead, it should declare neutrality. 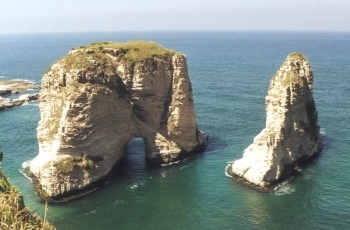 The #Lebanese should focus on prosperity, not others’ hostility. Thirdly, Lebanon should be cleansed of all weapons and explosive materials except those in the hands of the #Lebanese military and state security forces. Militias and guerilla groups should be outlawed as they are in every other state that calls itself a democracy. The army should be reinforced and empowered to protect Lebanon’s land and borders instead of the badly trained, poorly armed shell of a force it currently is. It’s evident that the government is neither courageous enough nor sufficiently motivated to do what requires to be done to make Lebanon safe and bring its citizens together. The job, therefore, falls to the people themselves. Indeed, the #Lebanese were the first to ignite the ‘Arab Spring in 2005 when their demonstrations helped oust the Syrian occupiers, heralding a new era of independence. Now they must grab the bull by the horns once more to rid their country from politician wannabe ‘religious leaders’ and false guardians, purporting to be Lebanon’s ‘friends’. Only a popular storm can topple the current cabal that is leading the nation into darkness. Those pontificating posers should be replaced by a strong leader wise enough to see the light; someone with enough guts to find it no matter how many toes he has to tread on along the way. Lastly I would appeal to the #Lebanese people, don’t be slaves to the will of self-interested, agenda-led politicians and religious leaders from all religions. They have misled you and manipulated you long enough. Now is the time to control your own lives and choose your future. Only when you the people decide to unchain yourselves can you breathe the sweet air of freedom when, believe me, Lebanon will blossom like never before.